“Twenty years ago, close to Zambia’s western border with Angola, I watched a young African man die of Aids. It was the first time I had witnessed such a thing, but not the last. The fact that Mankell chose to reveal these personal experiences and motives in exploring the subject at the end and not the beginning of the story is most interesting. Of course, he might have omitted the mention altogether, or he might have put it out front, in an introduction. Putting it in an epilogue has the curious effect of reinforcing what the reader has probably come to realize already: that the subject of this book, and the questions raised in this book about Africa, AIDS, the value of human lives in the poorer parts of this world, and most importantly how some seek profit in the suffering of others, all stem from a deeply personal relationship the author has with Africa (specifically Mozambique) and its people. In brief synopsis, Kennedy’s Brain is the story of Louise Cantor, a Swedish archaeologist working in Greece. When the story opens, she is preparing to return to Sweden for a conference and to visit family. Before departing, she tries to call her twenty-eight year old son Henrik at his apartment but he’s not answering. Upon her arrival in Sweden, she is bored and restless at her conference and so she leaves early to go see her son. She gets to his apartment and finds him dead in his bed of a barbiturate overdose. The story unfolds as Louise tries to understand and explain Henrik’s death. Her search is fueled by her refusal to believe that Henrik could have taken his own life. Her search for answers takes her nearly around the world, and into a dangerous and mysterious world inhabited by her son and a cast of fascinating characters. There are many unconventional aspects of this novel which seeks to personalize the African AIDS crisis in the story of a woman’s devastation over the death of her son. Louise’s inability to accept that Henrik’s death was suicide leads her to learn more about the life he lived in secret, and his fascination with President Kennedy’s brain which disappeared after his assassination. Kennedy’s Brain, is a symbol of the knowledge one takes to the grave, and suggests that there might be some way to read the thoughts of the dead like an old hard drive. But, as Louise’s search reveals, she finds that it not the case. The dead are not accessible like that, and in the end, the mystery of Henrik’s death is never completely understood. If one peruses reviews of this novel, it is clear that many found its unconventional plot disconcerting. For a writer like Mankell who has so successfully mastered the suspenseful art of police procedurals, Kennedy’s Brain might disappoint those looking for a Wallander-like plot. 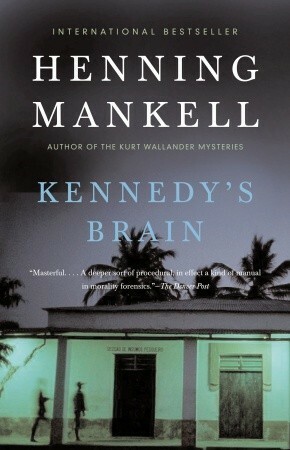 Without a doubt, Kennedy’s Brain is one of Mankell’s more experimental efforts. But for those interested in a more free use of suspense, which wrestles with issues and raises moral questions that defy hard answers, Kennedy’s Brain is an enjoyable and thought-provoking read.